We are offer for sale. 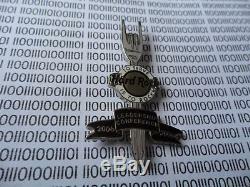 Hard Rock Cafe 2006 - GM Leadership Conference - STAFF Member Pin # 39764. With Dutch post TNT on regulair basis. Bayers from European country, s please note. The item "Hard Rock Cafe 2006 GM Leadership Conference STAFF Member Pin # 39764" is in sale since Tuesday, September 4, 2018. This item is in the category "Entertainment Memorabilia\Music Memorabilia\Rock & Pop\Artists H\Hard Rock Café\Pins". The seller is "ll00lll0l00lll0l" and is located in Groningen. This item can be shipped worldwide.